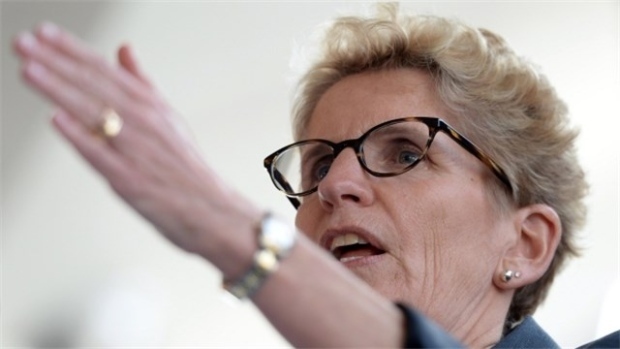 Premier Kathleen Wynne said Friday she is working on ideas to support Ontario businesses through major labour reforms, suggesting she is looking more at offsetting unrelated costs than pulling back the labour changes themselves. Many businesses and business groups have voiced opposition to the changes, in particular a plan to boost the minimum wage to $14 on Jan. 1 and to $15 in 2019. They have said a 32 per cent increase in less than 18 months will be tough to absorb. Loblaw Companies Ltd. (L.TO) said this week that minimum wage increases in Ontario and Alberta would hurt its bottom line, estimating the wage hikes would mean its labour costs will grow by about $190 million next year. Ontario's minimum wage increase is included in proposed legislation along with equal pay for part-time workers, increased vacation entitlements and expanded personal emergency leave. After participating in a roundtable discussion on labour in Windsor, Ont., Friday, Wynne said she has heard businesses' concerns as committee hearings on the bill have travelled the province this month. "I have committed to bringing forward some proposals in the fall that would support business in ways that, as I say, will allow them to go through this transition," she said. Wynne wouldn't divulge specifics of what she is planning, but mentioned that restaurant owners in particular have cited fees they pay to the Liquor Control Board of Ontario as an issue. "There are a number of suggestions that are coming forward," she said. "We're looking at everything." Economic Development Minister Brad Duguid has also suggested Ontario was looking at reducing other costs for businesses to help them cope with the labour changes. "We're also going to be offsetting some of those costs with initiatives like either eliminating or reducing fees that businesses pay to government for some of the services that they require," he said earlier this month. "So my expectation is we're going to work doubly hard on reducing regulatory burden to help some of those businesses that may have some challenge adjusting." A coalition of business groups including the Ontario Chamber of Commerce, Restaurants Canada and the Canadian Franchise Association have complained about the "arbitrary" minimum wage increase. "Many Ontario employers, especially small businesses, are now considering closing their business because they do not have the capacity to successfully manage such reforms," they wrote to Wynne earlier this month.